"The Pravo Orchestra has started from Békéscsaba, From Tótia as the descendants of the former Slovak wealthy peasant farmers call themselves over there. This is important information because Tótia is a very rich province in minorities: Slovaks, Gypsies, Hungarians, Romanians and Jewish lived and has been living there for centuries, and people are mixed as the instinct, the body and the hart dictated it. The members of the Pravo are all from this mixture. No little wonder that they have got themselves out of the Balkan folk music, they play Bulgarian, Macedonian, Serbian music. The character of this music is the same: receptive and is gladly thrown open if it is needed. Pravo set foot from here, since then has been playing in various places, holding dance halls; the members live in Pest mostly. I myself, who got to the Stormy-corner as an editor followed them and now both here and there I feel like home with them. We have stumbled together in the movie life (Megy a Gőzős), in the pubs (I wont enumerate). When already everything has burnt out inside me for good there comes a Pravo dance hall and again time has firmness for a good while." 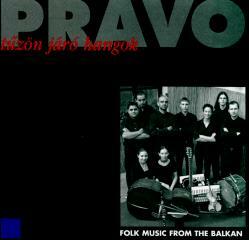 Serbian, Macedonian, Bulgarian tunes and the band's own compositions can be heard on this, their first album. The traditional and archatic ambience is interpreted using the Bulgarian bagpipe (gaida), the long flute (kaval), and the two-sided big drum (tapan), besides more well-known instruments. In English PRAVO means straight, true but also it is the name of a popular dance, which is featured on the first track.